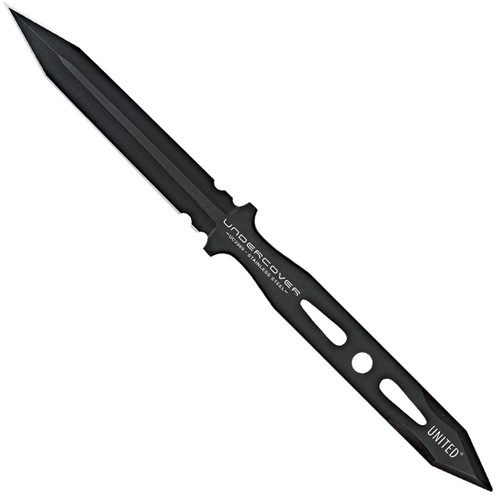 Stand confident that you're well protected with United Cutlery's Undercover tanto spike. Each knife is constructed using one solid piece of coated AUS-6 stainless steel that is 1/5" thick and incredibly strong. It won't break or bend like cheap imitations. The 3" double-edged blade is razor-sharp and performs equally well at stabbing and slashing. At 7 1/2" overall, it also makes the perfect concealed self-defense knife. The slim-profile allows it to be worn on the wrist or on the back of your belt using the included nylon sheath making it easily drawn in any scenario.